Enjoy the most beautiful day of your life in the romantic setting of a Renaissance Palace just off Hradčany Square in Prague! Take advantage of the possibility to have your wedding in the historical backdrop of the Martinicky Palace, just around the corner from the Prague Castle. Make use of the courtyard with an exquisite fountain, a grand hall with decorative ceilings and chandeliers, the chapel with biblical paintings, the stables, and a number of lounges with painted paneled ceilings. The whole palace has an unforgettable atmosphere. You and your loved ones will surely never forget the experience! 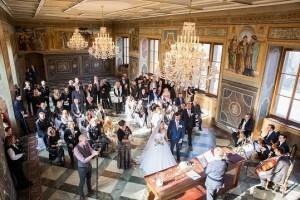 A wedding ceremony and reception at the Martinicky palace can be held in the courtyard, the stables or the large hall, and there are a number of other lounges and areas for you to relax. 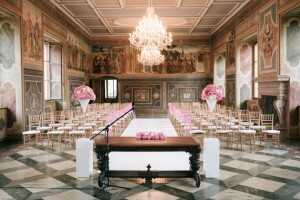 The Martinicky Palace offers you a unique opportunity to enjoy your special day. We are here to provide you with everything that will make your day a carefree event. Imagine arriving in an historic car in the courtyard of the palace, enjoying a glass of champagne in the courtyard before moving to the ceremony in the grand hall, the chapel or the gardens of the palace, all to the sounds of live music,with exquisite entertainment for your guests, while you will be photographed in our exclusive interiors.